Vicoden hydrocodone bitartrate-acetaminophen. Use: pain. 1-2 tablets every 4-6 hours as needed. Maximum 60mg hydrocodone/4000mg acetaminophen. Action: Inhibits prostaglandins. Reactions: Stupor, coma, bradycardia, cardiac arrest, circulatory collapse, renal tubular necrosis, thrombocytopenia, agranulocytosis, hepatic necrosis, hepatitis, hypoglycemia, hypoglycemic coma, respiratory depression, acute airway obstruction. May cause liver failure. Monitor for allergies and watch respiratory status. May mask abdominal disorders. Constipation normal side effect. Monitor for liver and kidney failure. Monitor for urine retention. Monitor BP and pulse. Gabapentin Use: pain from diabeteic neuropathy. 900mg-3.6 g daily in 3 doses. Give 2 hours after antacid. Action: Related to GABA but unknown. Reactions: leukopenia. Monitor for behavior changes. Can cause withdrawl. Venlafaxine Use: Depression, anxiety. 75mg daily. Maximum 22mg daily. Give with food. Action: Increases norepinephrine and serotonin. Watch for suicidal behavior. Do not use with methylene blue or linezolid. Use caution with renal impairment. Monitor for depression. Monitor BP and weight. Watch for serotonin syndrome. Take with a full glass of water. Risperidone Use: Schizophrenia 2mg daily, possibly 4-8mg daily. Maximum 16mg daily. Action: Blocks Dopamine in brain. Reactions: Neuroleptic malignant syndrome, suicide. Use caution if risk for aspiration pneumonia. Obtain baseline BP. Not effective in people with dementia. Monitor for tardive dyskinesia. Monitor for metabolic syndrome. Monitor for weight gain. 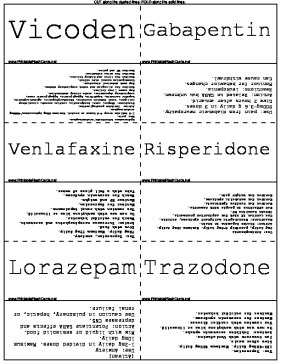 Lorazepam (Ativan) Use: Anxiety 1-2mg daily in divided doses. Maximum 10mg daily. Mix with liquid or semisolid food. Action: Potentiate GABA effects and depresses CNS. Use caution in pulmonary, hepatic, or renal failure. Trazodone Use: Depression. 150-400mg daily. Maximum 400mg daily. Give after meals. Can interact with Venlafaxine. Actions: Inhibits serotonin uptake. Do not use with methylene blue or linezolid. Use caution with cardiac disease. Monitor for serotonin syndrome. Monitor for suicidal behavior.